I last looked at the race to a billion in September 2010. I’ve now added a few more data points to the tracked platforms and also added points for the major console game platforms and Symbian. 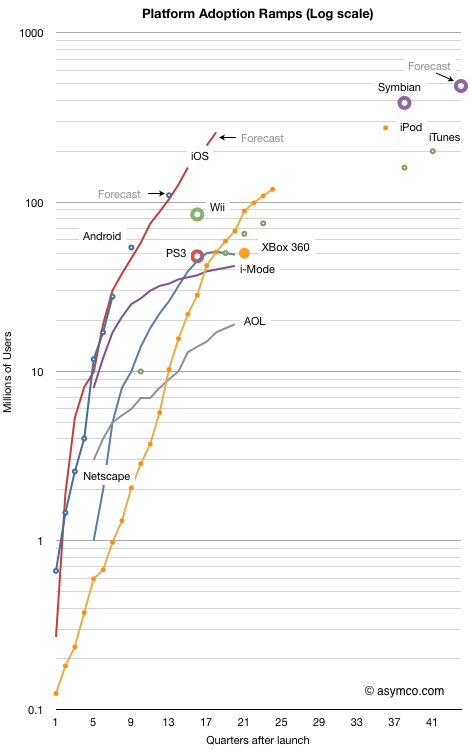 The chart shows the cumulative number of users (approximated by units sold) for 11 platforms indexed to the same starting date. The horizontal axis is the number of quarters since a platform launched. Every fourth quarter is numbered so each number on the axis represents a new year. The last number on the axis represents 10 years. The vertical axis is the cumulative number of users on a logarithmic scale. Each number of the vertical axis is 10x more users than the previous number. The top of the graph represents a billion users. The overall chart shows how quickly a platform has grown and is bounded by a billion users and a decade of usage. When judging the performance of a platform, the adoption slope and sustainability over time is perhaps the most interesting measure. One can see how many platforms slow down before reaching 100 million and so far none have hit the billion mark (Windows has but not in the 10 year time frame of this chart.) Looking at game consoles also shows the limits of a narrowly focused platform. They performed better than i-Mode and Netscape but not as well as iTunes or iPod which themselves have growth limits. The absolute highest cumulative sales total is Symbian, though now that it’s been deprecated, it’s set to be bypassed. It does appear that Android and iOS each have the potential to reach a billion users in less than a decade. Perhaps Android will do so faster but the mobile computing platform race will not play out as the personal computing platform race did. For Android I used my own summary data for historic performance except for the last estimate and forecast which came from IMS Research. iOS forecasts are my own. Symbian data comes from VisionMobile. Forecast is based on Nokia’s 150 million additional sales prediction. Game console data is current as of end of 2010 via Wikipedia. Other data sourced from Morgan Stanley.